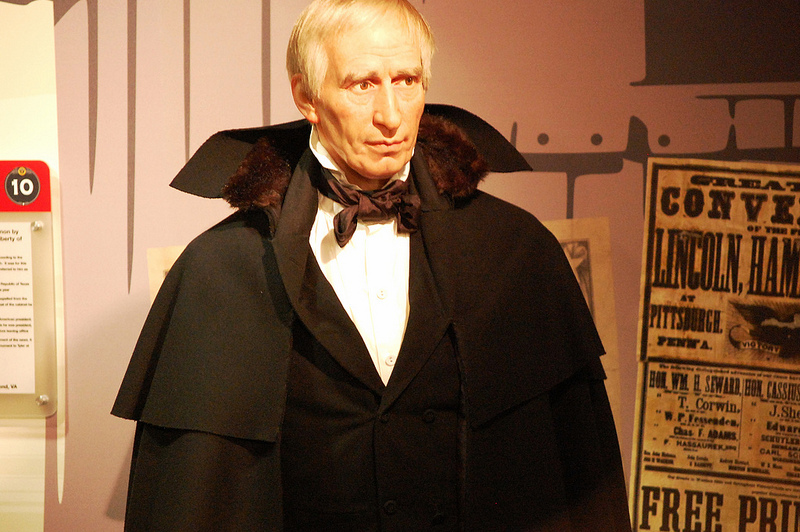 Why Didn’t Someone Just Buy William Henry Harrison A Coat? March 4, 1841. A hatless, coatless old man is shouting to a crowd on the streets of Washington DC in the wind and snow. Is he crazy? Is he lost? Is he a hobo? No, he’s the President of the United States, William Henry Harrison, giving his inaugural address – a speech that began the last and probably weirdest month of his life. Harrison was 68 years old, at the time the oldest person ever elected president. And he was not in the best of health to begin with. So why was he bandying about the capital city with no hat and coat – in snow and wind, no less? Well, Harrison was going to prove that he was still as vigorous as he was when he won the battle of Tippecanoe back in 1811, and every bit as smart as those eggheads who had bashed him as the candidate of illiterate frontier farmers and drunken backwoodsmen. And so, the hatless, coatless president stood under the East Portico of the US Capitol and talked. For two hours. He talked on and on, about the history of the veto power under the constitution, about how he wouldn’t seek a second term on the grounds that the founders should not have allowed reelection in the first place, and, above all, about the history… of Rome. Harrison’s speech mentions two Americans, former presidents Jefferson and Madison, but it mentions so many Romans I’m surprised he didn’t try giving it in Latin. In all, Harrison’s inaugural address comprised 8,445 words; no president before or since has come close. He probably should have edited it down some more, because standing outside in the snow for two hours tends to make one’s clothes wet. 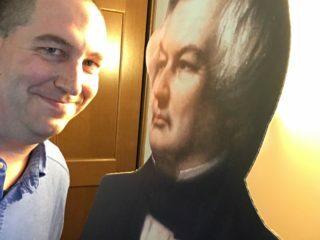 And Harrison’s day was just getting started: he took part in three inaugural balls, a record for the time, and was accosted by so many office-seekers that “he staggered upstairs to revive himself with ‘stimulants. '” In the process of trying to look vigorous, Harrison had worn himself out. Most accounts say the new president caught a cold on inauguration day, though not all do; either way, he definitely had a cold several weeks later, when he again went out in cold, wet weather without a coat on. This bizarre habit, coupled with living in the drafty, poorly heated White House, proved too much, and Harrison’s cold turned to pneumonia. In 1841, the effects of pneumonia were, as they are today, serious business, but they weren’t the worst part of the illness. The treatments were far worse, and because the patient was the president, there were many of them. The doctors, working on the pre-germ theory that illness-causing “humors” embedded in the skin, blistered Harrison’s chest using heated suction cups. Then they tried the old remedy of bleeding – though they took pains to limit the bleeding, on account of Harrison’s age and because, well, bleeding kind of killed George Washington. When those didn’t work, they gave him brandy, the herb camphor, Virginia snakeroot weed and opium. Not content with dope and drink, the doctors tried “calomel, ipecac and rhubarb” –  and a few stimulants to revive him from all that. Somewhere along the line the desperate doctors turned to remedies they would have never used in less extreme circumstances – they tried the traditional medicine of the Seneca people, which by most accounts involved some kind of ceremony using live snakes. Sadly, I have been unable to find any information beyond repeated references to “the use of live snakes,” because I would love to know what the heck was going on in there. Nonetheless, Harrison’s poor body, weakened by pneumonia and battered by all manner of ineffective remedies, cried out “Enough is enough! I have had it with these monkey-fightin’ snakes on this Monday-to-Friday plane” and gave out completely. Harrison sunk into delirium, told his doctor (whom he apparently mistook for Vice President John Tyler) to carry out the principles of government, and then died, one month after traipsing about the Capitol grounds in the snow. While technically Harrison accomplished nothing during his short presidency, he did demonstrate the importance of a president bundling up when it’s cold out. And no president since has given an inaugural speech outside the Capitol without putting a coat on. From what I can see, history does not tell us what William Henry Harrison wore in death, though we do know this much: his closed coffin left the White House in a carriage, which was itself covered in black drapery. Plenty of layers no matter what the weather. 1] Kaufman, Bill. “He Died of the Presidency,” American Enterprise, April 2006, Vol 17, Issue 3, p. 45. Reynolds, David S. Waking Giant.HarperCollins, 2009, p. 327. Accessed via Google Books, January 19, 2013. Hamilton, Neil A. Presidents. Infobase Publishing, 2010, p. 81. Accessed via Google Books, January 19, 2013. Green, James A. William Henry Harrison: His life and times. Garrett and Massie, Incorporated, 1941, p. 399. Accessed via Google Books, January 19, 2013.